Heavy, double-faced hammer makes short work of demolition and driving work. Excellent weight-to-length ratio helps you remain accurate when driving spikes and wedges. Comfortable tapered handle feels good in the hands. Type: Construction - Sledge; Head Type: Drilling/Engineer; Head Material: Steel; Handle Type: Tapered Fiberpro. 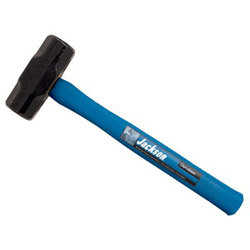 Sledge Hammers from Jackson Professional Tools! 625 In Stock today.